Wyld's New Plan of London and its Vicinity. A large and appealing pocket map of London, england issued by James Wyld in 1889. Centered on the Thames, this map covers central London from Highgate to the Victoria Docks and from Brixton to Chiswick. Made with the foreign tourist in mind, Wyld's map shows most streets, important buildings, inns, churches, trading centers, markets, parks, and rail lines. The whole is surrounded by a decorative border with letter and number grid references. 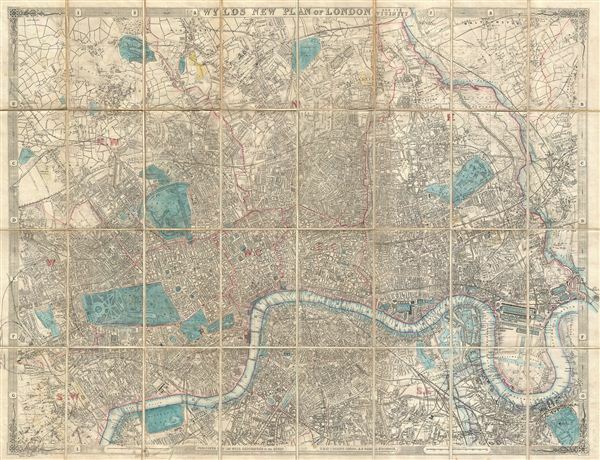 Wyld first issued this map in 1867 and it went through multiple states to reflect rapid urban development that transformed London into the first truly modern metropolis. This is an uncommon later state of the map and is not listed by Hyde. Very good condition. Dissected and mounted on linen. Missing original linen binder. Hyde, Ralph, Printed Maps of Victorian London, 1851 - 1900, no. 119 (this state is not identified by Hyde).